Nikon’s yearly incremental upgrading program has been very ambitious in the last few years. And nowhere is it more noticeable than in the firm’s entry-level D3000 series. Last year’s model, the D3200 showed several worthy improvements over the previous D3100 model, not the least being a 24-Mpix CMOS sensor, and the Expeed 3 processor allowing a maximum sensitivity as high as ISO 6,400 (expandable to 12,800). Faster continuous shooting up to 4 fps was also added. For this year Nikon has expanded the capability yet again, and perhaps enough now to tempt professional photographers looking for a low-cost body for specific applications. Nikon has removed the AA filter in front of the 24-Mpix CMOS sensor, which should improve resolving of fine detail. They’ve also upgraded the processor to Expeed 4, permitting higher maximum sensor sensitivity up to ISO 12,800 (ISO 25,600 extended) as well as a faster burst rate, up to 5fps. The more powerful processor allows Nikon to add more features to appeal to video enthusiasts, notably Full HD at 60/50 frame rates for slow-motion footage (in addition to the 24 fps and 25/30 fps options of the previous model). The D3300 also inherits the longer lasting battery from the D5300, and is available now with the new retractable AF-S Nikkor 18-55mm f3.5-5.6G VR II at $649. 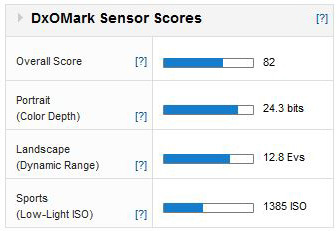 With a DxOMark a score of 82 points the Nikon D3300 achieves 25th place overall in our sensor rankings. That’s on a par with the full-frame Nikon D3s (now discontinued) and the newer Canon EOS 6D and EOS 1Dx as well some rival APS-C models such as the Pentax K-5 II and K-5 IIs models. However while color depth and low light scores are excellent, the dynamic range of 12.8 Evs at base ISO is lower than expected. Nikon’s three consumer oriented APS-C models are all quipped with similar 24-Mpix sensors, and each one forgoes an anti-aliasing (AA) filter in order to preserve as much fine detail as the sensor is capable of capturing. Resolution as an independent metric isn’t presented in this instance but the sensor’s signal quality of all three models is ostensibly the same. In reality, though, the D3300 isn’t quite a match for either the D5300 or the high-end D7100. While all three share the same color depth and low light capabilities, the D3300 has -1 stop less dynamic range at base ISO. 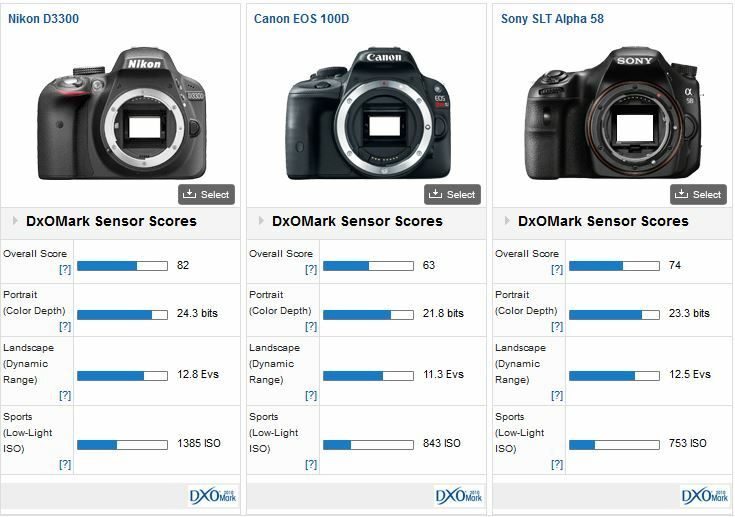 If we look closer at our measurement data, between the D5300 and D3300, the two share similar color sensitivity and color response. 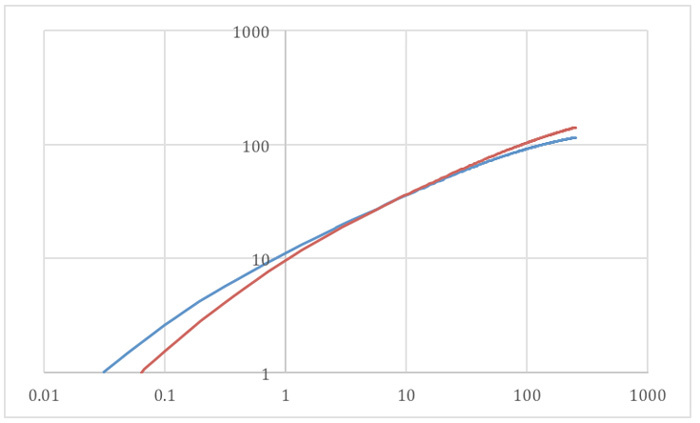 But, there is a noise difference for the lowest grayscale between the two (grayscale inferior to 1% of the dynamic). In the case of the D3300 this higher noise reduces the dynamic range, but not the color sensitivity. Color sensitivity between the two models is very close. 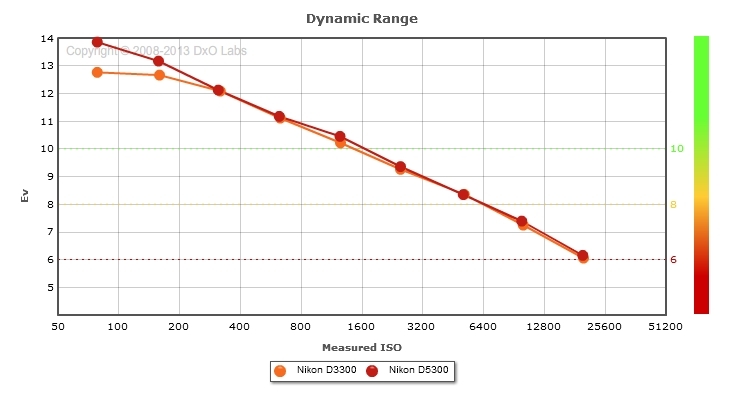 Compared with rival offerings, the sensor performance of the Nikon D3300 is class leading. It has +1.33 stop improvement in sensitivity over the Canon EOS Rebel SL1 (100D) and the equivalent of +2/3 stop in IQ over the Sony SLT Alpha 58. 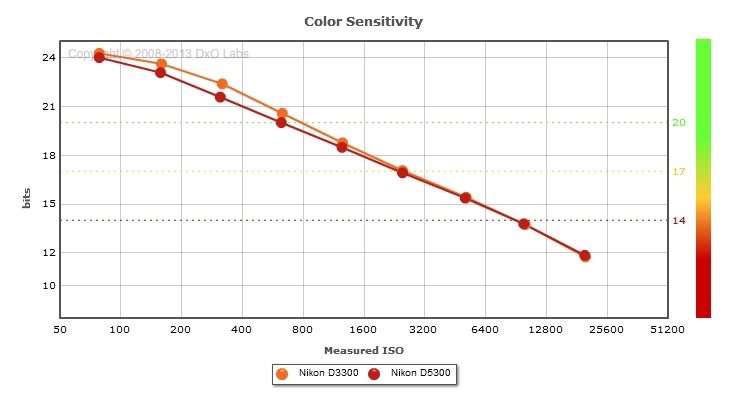 In terms of color sensitivity, the D3300 has a +1.5 stop advantage over the Rebel SL1, and +2/3 stop over the Sony. The dynamic range is similar to the Sony (the Nikon sensor has a 1/3 stop wider range) increasing to +1.5 stops over the Canon. There’s also sizeable difference in low light capabilities between them. Against the Canon sensor, the Nikon has a +2/3 stop advantage, rising to close to +1 stop over the Sony. 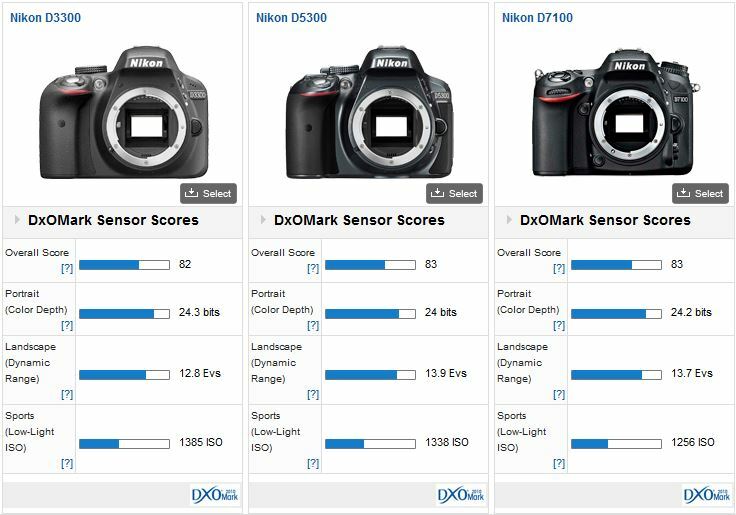 Signal quality of the Nikon D3300 sensor compares well against other APS-C models in the line-up and it outshines that of rival entry-level models. Although the results are similar to its predecessor, the removal of the AA filter promises improved sensor resolution. 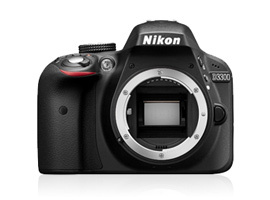 Combine that with the revised features and capability and the new Nikon D3300 looks better value than ever.